The Nicolosi Estate stands at 414 St. Pierre Rd. in Bel Air, California. 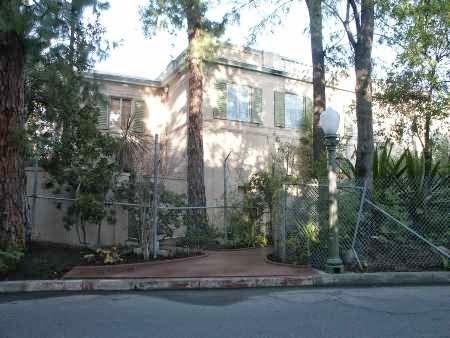 Rumors are rampant on the internet about the broken down building including the idea that it was once owned and occupied by William Randolph Hearst’s long-time love interest, Marion Davies. Other rumors say that John F. and Jaqueline Kennedy stayed at this location on their honeymoon. Then there are the Tarzan stories about Johnny Weissmuller having owned the home, although a few reports say that he only rented the home from Marion Davies. I started my research on this house after reading Mackenzie Phillips’ book, High on Arrival. It happened to be near another mansion that was recently built toward the back of 414 and across the street. I found that house while goofing around on the internet. This roused my interest even further considering the close proximity of the homes. The information I found does not establish any connection to the house with Marion Davies or William Randolph Hearst. It is believed that the tale was spun to make it more interesting for the tourist guides. The Kennedy's did not honeymoon at this home either. It was a property of Marion Davies that they stayed at, but this is not the one. There is a great deal of information that does lead us to believe that Weissmuller indeed lived in the home. In fact, the home was commissioned for him and famed architect, Paul Williams was the designer. This is the story that makes the most sense considering the size of the pool and Johnny’s great love of swimming. He was a swim competitor who was accustomed to winning. The pool, as described by Mackenzie in the book, is extremely long. It stretches out and bends around the house in a moat like pattern. It is a very narrow pool and there were built in fountains that kept the water at the right level. Construction on the house was completed in 1931. There was no indication that he ever rented the home from Davies or that Davies actually lived in the home. The next inhabitants are definitive because there is substantial information from newspaper clippings from the time. In 1961, Joseph Nicolosi died of a heart attack in the home. He had a wife and three daughters. His wife’s name was Lucy; however, the daughter’s names were not listed in the obituary. Lucy continued to live in the house for several years because there is another newspaper clipping stating that she was giving a tea for a college introduction for high school girls at the residence. That was in March of 1965. Yet another newspaper clipping shows that a Marie Nicolosi called police just months after Mr. Nicolosi passed away. She stated that she was on the roof of the home attempting to stave off fire (there was a huge wildfire in the area that destroyed many homes in the hills that year). She said that a portable television was stolen from inside the residence at that time. If that does not cement the fact that the Nicolosi’s owned the residence for many years, a recent finding shows that a LillianNicolosi-Nall purchased the home in 1999. Permits were issued for electrical repairs to the house as well as structural repairs in the same year. A comment by someone in a forum discussing the house stated that family members were in dispute over repairing the house. One wanted to make the repairs and the other did not because of the high cost. Lillian is the only person listed as the owner of the home for the 1999 sale; therefore, it can be surmised that she bought out whoever it was that was attempting to stop renovations. As many already know, the house has yet to be repaired and continues to sit in decay, although it was put on the registry of monuments for the city. This information can be reasonably established because people such as Lindsey (I’m No Stalker), have visited the home an reported it is still abandoned and decaying. Her blog post about that visit is dated in 2012. As we can reasonably ascertain that the Nicolosi Estate is and has been in Nicolosi hands for several decades, it is also reasonable to accept that Mick Jagger and John Phillips did rent the home. Mick Jagger is said to have rented it from late 1971 to 1972. There is at least one photo of him standing on the balcony of the house. The information was also published in a book by one of Jagger’s employees at the time. After Jagger pulled up stakes, John Phillips and his new wife, Genevieve moved in. They may or may not have been surprised that Mackenzie showed up at their doorstep one day and said she was moving in. Regardless, it seems like a dark and dismal place when you hear some of her descriptions, not so much of the house, but of her feeling in the house when her father did not return. He left the young girl in the house to fend for herself, basically. There was no food and the rent was not paid. She talked about how they would ride the Big Wheels inside the empty pool, but she also talked about the empty, scared feeling she had when her father literally abandoned her there. Little is known about who has inhabited the home since the Phillips left it. If I remember correctly, it was in a state of disrepair at that time, possibly from John’s penchant for throwing wild parties and his incessant drug habit. The next story is unsubstantiated. There was a fire in the house sometime in the 1980’s. The exact date and nature of the fire is unknown and finding any reports on it is nearly impossible. Anyone who has found information on that fire is welcome to fill me in on it. There is a legend to go with it though. It also pays to note that Mackenzie said that the house came furnished, but that her father added his own personal touches to it. Someone posted that they heard that a man set the house on fire, starting in the master bedroom. His family was in the home at the time. He fled and that is all the information that was given. Whether anyone was supposed to have died during that fire was not revealed. It is believed that this is one of the reasons that the house has remained empty for so long. Some reports say that the house was gutted at the time of the fire. Other reports state that there was only minor damage. None of the reports are based on anything other than speculation and lore. Any new information on this estate would be greatly appreciated. I will not be continuing my search for facts about this estate because the internet has already been turned upside down for the information that I have shared here. Tour guides should probably stop using the Marion Davies story since there is absolutely no substantial information to back it up. The is about the architect. It is a protected building so there are a lot of hoops to jump through to fix it up. My great grandparents are the Zublins. I wish there were pics of the interiors! My Grandpa was Johnny Weissmuller. I'm trying to get ahold of the property owner. I would love to hear a bit about that place. If anyone knows Lillian Nicolosi-Nall, please give her my email address:adamskyriver@gmail.com. Hi , yes I'm obsessed with this house lol , any how friends of mine in about 1990 or 1991 had discovered this house and then right after saw an Episode on current affair that the man that set it on for in the 1980's was and attorney and was married . His wife had gotten pregnant with twins and he was not happy about this and set the wife and the babies on fire . My friends that snuck in said that there were photos all over the ground and a suit case that had clothes falling out of it . Im going to ask her if I'm leaving anything out . Info on this house is next to impossible to find ! I wonder if someone can find old episodes of Current Affair ? , supposedly cant be torn down, but I do remember the story of the family not agreeing on spending the money to restore it, so it sits there, very sad. I spent quite a bit of time there. Specifically remember the party celebrating the publishing of Betty Lasky's book "RKO: The Biggest Little Major Of Them All" and talking to legend Hal Roach for over an hour. Joseph Nicolosi's Bronze sculptures are amazing (See Memorial Court Of Honor at LA Coliseum). As far as I know Lilian Nall still owns the property. A Lovely lady very much a patron to the arts and a brilliant host. I have always been interested in the house. It does seem a disgrace that it's left to rot. I too have been wondering what happened to this house and why it is still standing left to rot. Obviously the county must own it, otherwise someone is paying taxes on that property. So who is paying taxes on it? I would like to go through this house. To do paranormal investigation. Dawn is the author of Danny's Grace- A novel about the trials and subsequent effects of childhood abuse.